Tags: Bruce Foreman, calendar, daily calendar., Gongga Shan, Henry David Thoreau, horse, Horseman, horses, inspirational, inspirational quotes, Kham Tibet, Minyak Kongka, nature, nature quotes, poetic universe, quotes, snow, snow quotes, Tibet, tibetan, Tibetan China, Tibetan China borderlands. This entry was posted on February 24, 2012 at 5:43 am and is filed under Uncategorized. You can follow any responses to this entry through the RSS 2.0 feed. You can leave a response, or trackback from your own site. Yes I can remember putting our ears to beatiful ghost gums and thinking we heard small people in them,,the clinking of cups and the pouring of water..it maybe true. Wonderful image and quote ..just about the best… will the poster have the quote on it..I hope. I often think of the massive oak tree at the back of my chidhood home I grew up with it looking down on me. Thanks for the comments and the votes – all noted. Its really interesting which pictures you respond to. 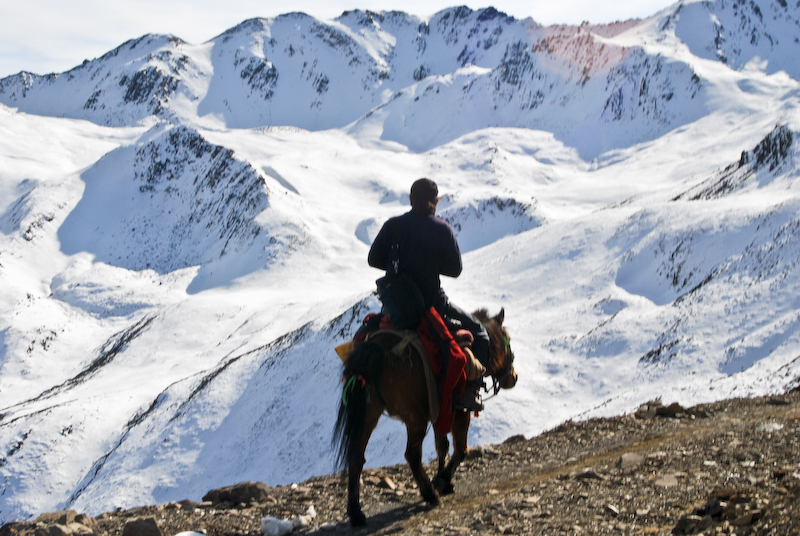 This one for instance – a horse trek to Gongga Shan, I have always overlooked. It has come from a folder that I have trawled through several times and it has always remained hidden to me as anything special. I am very happy that it has not only made the grade but is getting poster status as well. The plan is to design a poster with a very light dove-grey border with both the quote and the Poetic Universe Tibetan calendar logo in the corner. I need also to research whether there is any copyright issues with reproducing the quotes – does anyone know the law on this? I don’t know about copyright but the fact that these quotes are on many websites for public use and I would assume that these websites do not pay for them..it should be OK.
the answer is Google ….or call a lawyer.